This three-disc DVD box set contains Eisenberg's four thematically connected films - Displaced Person, Cooperation of Parts, Persistence, and Something More Than Night - made between 1981 and 2003, exploring the ongoing implications of the Second World War and the fall of the Berlin Wall, as well as the relationships between the past, present and future, and how the meanings of events transform over time. The disks are accompanied by a booklet with a contextualizing essay by Scott Durham and an artist interview with Domieta Torlasco, along with title descriptions, an artist biography and filmography. "Pulling in anchors of ephemerality, reconstruction, and salvage, and treating the present as the past and vice versa in a redemptive fashion... Daniel Eisenberg interrogates the soul of history." "Daniel Eisenberg's films are celluloid tapestries woven together out of histories and memories, night and day, daily life and reflection." 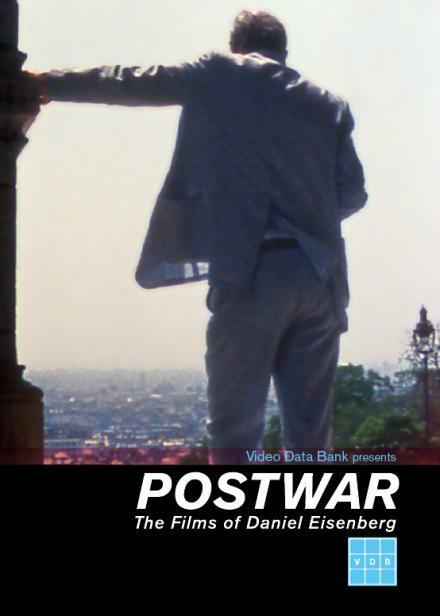 DVD box set can also be ordered with accompanying book, POSTWAR: The Films of Daniel Eisenberg, the first major critical study of the filmmaker, edited by Jeffrey Skoller, and published by Black Dog Publishing. Book includes essays by Tom Gunning, Raymond Bellour, Nora M. Alter, Claude Lévi-Strauss, Jeffrey Skoller, Leora Auslander, Scott Durham, Crista Blümlinger, and Daniel Eisenberg.